7Twelve portfolio performance from 1999 to 2018 is shown below. Note that numbers in red indicate negative returns. * Performance assumes equally weighting each sub-asset and annual rebalancing. Taxes and inflation were not taken into account. PAST PERFORMANCE IS NO GUARANTEE OF FUTURE PERFORMANCE. 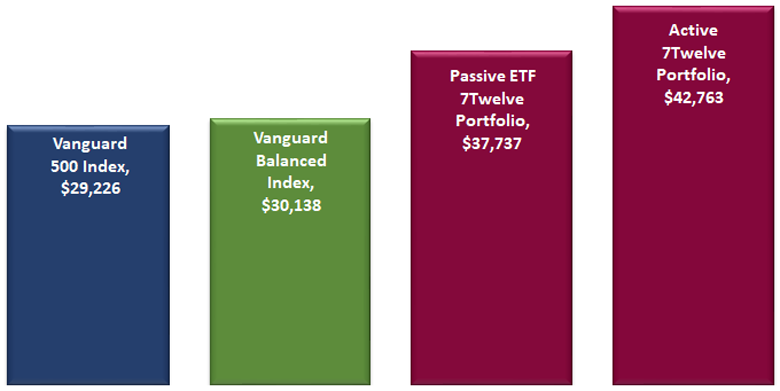 Raw performance data utilized in Active and Passive 7Twelve models have changed slightly in some years due to transitioning from market price to NAV return data. ** Average annualized return is a geometric mean, not an arithmetic mean. For a performance update, download and read our Performance Update.